Aven & Mark discuss life, academics, history, literature, and language, and the sometimes surprising connections between them all. 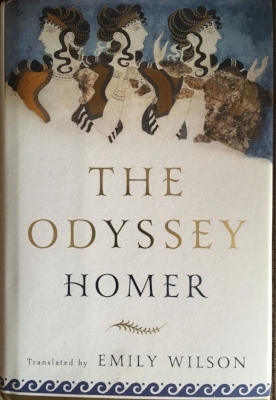 We interview Emily Wilson, whose new translation of the Odyssey for Norton was published in November to great acclaim and critical praise. She tells us about some of her choices in the areas of metre, vocabulary, register, and more, and we discuss the very concept of 'choice' in translation, the notion of a 'faithful' translation, the complicated question of heroic women, and 70's blaxpoitation films! Your email address will never be shared with anyone for any purpose whatsoever. Kaufman, Cathy. “The Ideal Christmas Dinner.” Gastronomica, vol. 4, no. 4, 2004, pp. 17–24. Leach, Helen. “Translating the 18th Century Pudding.” Islands of Inquiry: Colonisation, Seafaring and the Archaeology of Maritime Landscapes, edited by Geoffrey Clark et al., vol. 29, ANU Press, 2008, pp. 381–396. Lemasson, Jean-Pierre. "The Long History of the Tourtière of Quebec's Lac-St-Jean", in What's to Eat? Entrees in Canadian Food History, edited by Nathalie Cooke, McGill-Queens UP, 2009. Episode 48: Talking Teaching with Mythtake! 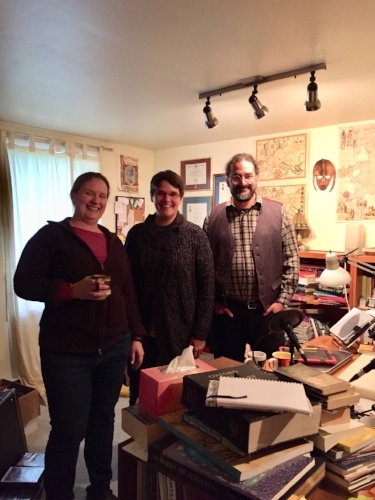 Alison & Darrin from MythTake Podcast dropped by Sudbury -- and sat down with us for a chat about teaching myth, literature, and more. Make sure you check out their podcast for great discussions about myth and Greek literature. We talk to Prof. Richard Thomas about his new book about Bob Dylan and the Classics, discussing Latin poetry, intertextuality in music and literature, Dylan's similarities to Catullus and use of Virgil and Ovid, and the unexpected connections between Classical scholarship and research into folk music archives. We talk to podcaster and author Mike Duncan about his book, podcasting, Roman history, and more. Thanks to Mike for joining us -- and everyone, go get his book, it's great! Our Hallowe'en themed episode this year is about costumes -- and etymologies and origin stories of a whole bunch of iconic items of clothing. We talk about the semiotics of fashion, the many varieties of the toga, and hats that caused fainting fits, and finish off with a couple of spooky Roman stories! Also, check out this year's Hallowe'en video, on words for Ghost. What words did the Greeks, Romans, and Anglo-Saxons use to talk about different groups of people? What differences did they think were important? How do those compare to modern conceptions of ethnicity, national identity, or race? We try to give some basic background on this complicated question, starting with the etymology of the vocabulary and addressing some of the ways differences were conceptualized. How is the Ancient Mediterranean Diverse If Everyone There Is "White"? “Did ancient identity depend on ethnicity? A preliminary probe” Erich Gruen. Phoenix. Vol. 67, No. 1/2 (2013), pp. 1-22. “Medieval and Modern Concepts of Race and Ethnicity” Robert Bartlett. Race and Ethnicity in Anglo-Saxon Literature. Stephen Harris, Taylor & Francis, 2003. Where the the term "White People" come from? Time to talk about the greatest hero of them all! Why are there so many movies about Hercules? Why do they all have lions and snakes in them, but no journeys to the underworld, and only a sprinkling of family murder? 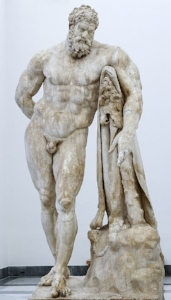 Who's the most Herculean Hercules, and how did Mr. Universe do in the role? And, most importantly, how much virtue is in every part of the mighty Hercules??? We discuss the murky origins of the word 'Bug', some Latin & Greek words for insects, ancient notions of authorship, medieval guild secrets, and the history of patents. Also, sacred geese, burglar alarms, and a Latin mock-epic about a heroic gnat! We're declaring this the first episode of Season 3 of the podcast! In this episode, long after everyone else has talked about it, we review the movie Arrival and discuss the linguistic and philosophical issues that it raises, including of course the infamous Sapir-Whorf hypothesis. Oh, and check out our attempt at creating a theme cocktail! We're back at the cottage, and this time we're talking to Ian and Susan McMaster about language, computer programming, poetry, music, theatre, and more, as we chat about the serendipitous connections that led to careers, performances, and relationships. 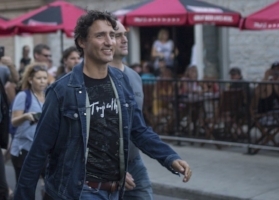 Along the way we play a few tracks of Susan McMaster's poetry, more of which (both texts and recordings) can be found at her website. Susan's recent publications include Crossing Arcs: Alzheimer's, My Mother, and Me and Lizard Love: Artists Scan Poems. The three works included in the podcast are "Shadowless" from Pass This Way Again (Underwhich Editions), the beginning of "The Pleasure of Lusting" from Geode Music & Poetry, and "Science Song #1" from Dark Galaxies. We talk about the early history of paleontology and geology, the first fossil hunters, the Bone Wars, and the possible ties between fossils and Greek myth. Also, a bonus poem about a mammoth cheese! Mayor, A. (2011), The First Fossil Hunters: Dinosaurs, Mammoths, and Myth in Greek and Roman Times (2nd revised edition of The First Fossil Hunters: Paleontology in Greek and Roman Times (2000)), Princeton, Princeton University Press. See the end of this blog post for the "Ode to a Mammoth Cheese" poem. We saw Wonder Woman -- and have lots to say about the history of the comic, Amazons, Greek myth, ancient Greek dolls, and more. We talk to Laura Carlson from The Feast Podcast about recreating historical recipes, the many meanings of food, and what exactly defines a 'recipe'. This is part of The Recipe Project's Virtual Conversation: What is a Recipe? which started on June 2nd, 2017 and is continuing until July 5th, and you can join in the conversation by leaving a comment here or by checking out the hashtag #recipesconf on Twitter and Instagram. The Recipe Project: A Virtual Conversation, "What is a Recipe?" We discuss how the recent Guy Ritchie movie King Arthur: Legend of the Sword fits into the history of adaptations of the Arthur legend. What kind of Arthur does it present, how does it interact with the Arthurian tradition, and what themes does it explore? And who has the biggest...er...elephants? "Color in Ritchie's Legend of the Sword"
"Will the Real King Arthur Please Rise"
"Lock, Stock, & Two Smoking Broadswords"
We're getting saucy with a discussion about the etymology and history of condiments -- from Roman garum to Worcestershire sauce, through Escoffier and seasonings, to the global implications of ketchup. Bober, Phyllis Pray. Art, Culture, & Cuisine: Ancient & Medieval Gastronomy. U of Chicago P, 1999. Curtis, Robert I. “In Defense of Garum”. The Classical Journal, Vol. 78, No. 3 (Feb. - Mar., 1983), pp. 232-240. Corcoran, Thomas H. “Roman Fish Sauces”. The Classical Journal, Vol. 58, No. 5 (Feb., 1963), pp. 204-210. We discuss the origins of the Gimlet cocktail, the stories about its name, and its connection to the treatment of scurvy; then we talk about some of the other diseases tied to the early era of European expansion and colonialism, including the classical history of malaria in Greece and Rome. Also featuring conversation about gin, the pronunciation of quinine, and a cameo appearance by Alexander the Great! Malaria and Rome: A History of Malaria in Ancient Italy, Robert Sallares, OUP 2002. "The Rhodes Colossus" – cartoon by Edward Linley Sambourne, published in Punch after Rhodes announced plans for a telegraph line from Cape Town to Cairo in 1892. We finish up our colour series (for now!) with a discussion of Purple, Pink, & Brown. From Phoenician shellfish, Virgil's Aeneas,& Propertius's Cynthia, to flowers, beavers, & bears, this episode covers a lot of ground. Let us know what fun colour facts we've missed, and what colourful topics you might like us to cover in the future! Note: one area of discussion we rather left out is the place of purple in Byzantium/the Eastern Empire... maybe we’ll pick that up in the next episode briefly! We've joined forces with the MythTake podcast for a pair of episodes about the myth of Theseus, the Minotaur, and Ariadne. In our episode we talk about the story of Theseus & Ariadne, and the development of the word 'Clue' from Chaucer's version of the tale, as well as Catullus and Ovid's depictions of Ariadne's abandonment, and the connections to fingerprints, detective fiction, and Agatha Christie's life. Meanwhile, Alison & Darrin in their episode talk about two poems by Bacchylides, and the Greek sources for the life of Theseus and his heroic exploits, as well as a few more English words derived from his adventures. It's #CreateICG Week! A bunch of internet creators are putting out videos, podcasts, blogs, & more, all on the theme of CREATE – with all sorts of different approaches and interpretations. The event is centred around the Internet Creators Guild, a non-profit organization with a mission to support, represent, and connect creators whose primary platform is online. If you’d like to find out more about them, you can go to internetcreatorsguild.com – and to find more amazing creations by ICG members, search #CreateICG on your social media of choice, check our show notes for links, or go to createicg.wordpress.com for lists of creators and their works. In this episode we talk about the etymology of CREATE, the origin of breakfast, how mealtimes moved around the day, the history of theatrical and artificial lighting, and Greek and Norse creation myths -- including the story of the body-fluid-filled mead of inspiration!